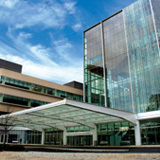 Penn Radiology at the Perelman Center for Advanced Medicine offers state-of-the art, low-dose imaging services in one of Philadelphia’s most modern medical facilities. Penn radiologists are board certified and faculty of the Perelman School of Medicine. They work in a collaborative environment, which allows for better interpretations of imaging results and enables more precise diagnoses.